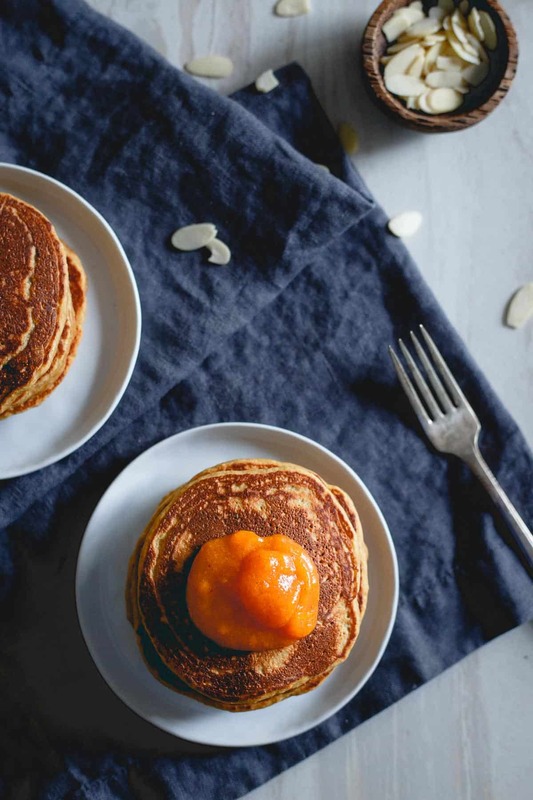 These persimmon pancakes are made with the pulp of the sweet persimmon fruit and full of almond flavor. They’re a delicious winter breakfast! This week persimmon is the fall fruit of choice. Up until last winter I can’t recall ever having a persimmon. I’m sure I did in a dessert at one point or another, but I had never eaten the fruit whole. So, I bought one, brought it home and then stared at it on the counter wondering how the heck to eat the thing. I assumed it was like an apple, just wash and bite into it so, after a few days when I thought it felt ripe enough that’s exactly what I did. Then proceeded to spit the entire thing out in disgust. Have you ever tasted persimmon skin? It’s the most bitter, chalky tasting nastiness ever. Some quick googling informed me that was not how you eat a persimmon at all. Rather, you cut off the top and scoop out the flesh. So that’s what I did and the fruit redeemed itself with a deliciously sweet and juicy flesh. After that first shaky encounter, we ended up having quite the relationship over the winter months. It might be the only fruit in history that has ever pulled off the whole dessert by itself thing in my mind. No matter how sweet and in season any other fruit is, I’ve never considered it dessert. It’s fruit, not a substitute for chocolate, ice cream or cookies. Persimmon, however, actually passed as dessert many a nights when perfectly ripe. Anything that can do that deserves to be incorporated into breakfast, no? 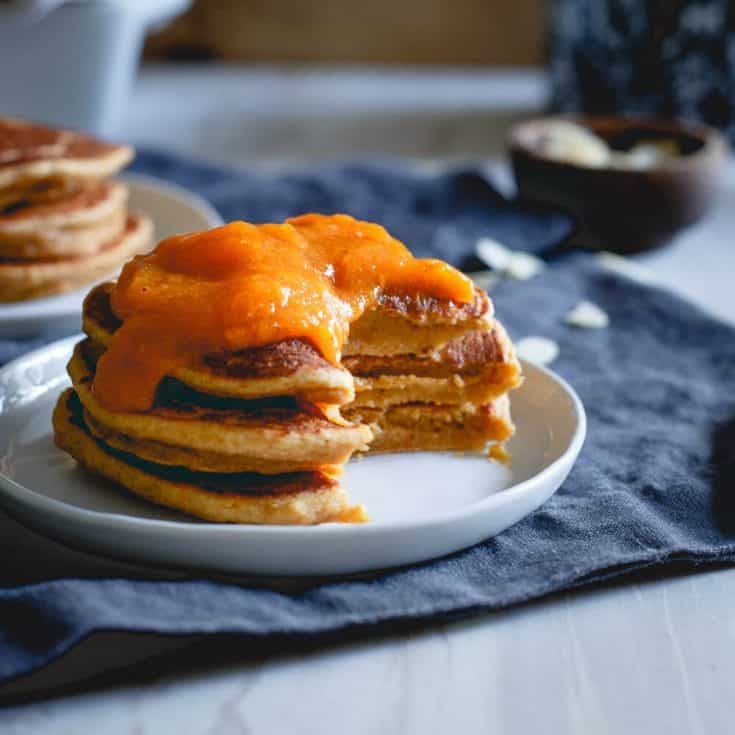 These persimmon pancakes came out thick, dense and full of the sweet persimmon flavor. No need for sugar, the fruit does all the work. Toasted almond slices were the perfect thing to balance out the sweetness. 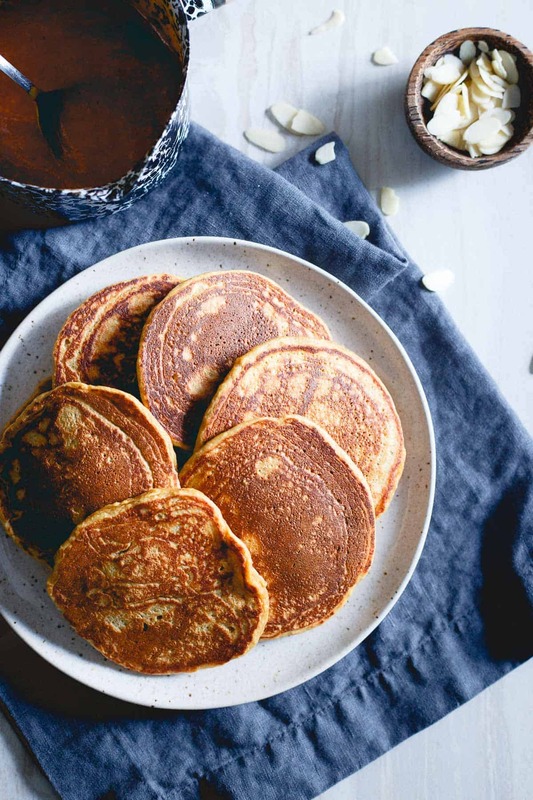 If you’re looking for pancake recipe that’s a little more protein focused don’t miss these perfect protein pancakes or these pumpkin protein pancakes. 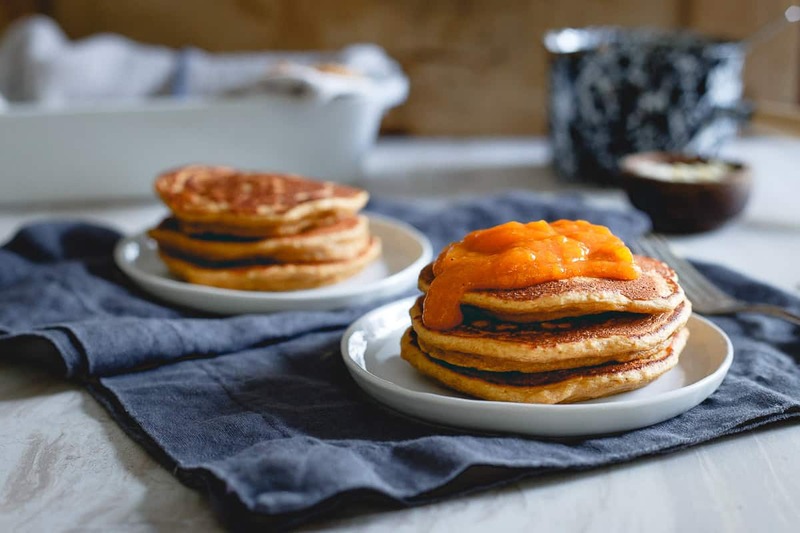 These persimmon pancakes are made with the pulp of the sweet persimmon fruit and full of almonds. They're a delicious winter breakfast! Slice the tops off of the persimmons and scoop the flesh out into a food processor. Process until pureed. Set aside. Combine the flour, baking powder, salt and spices in a medium bowl. Add the egg, coconut oil, vanilla extract, 1/4 teaspoon of the almond extract and 1/2 cup of the persimmon puree to the bowl. Slowly whisk in 3/4 cup of the milk until well combined. Add up to a 1/4 cup more if needed for a more "pourable" batter. Batter will be on the thicker side. Grease a large skillet with butter over medium heat. Place the batter on the hot skillet in about 1/4 cup scoops and cook for 1-2 minutes per side. 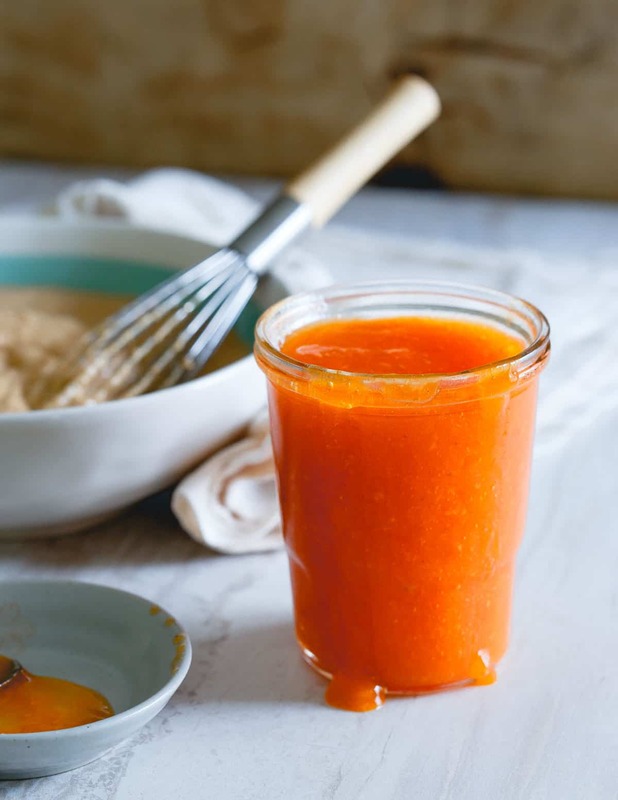 Make the persimmon topping by combining the remaining persimmon puree with the remaining 1/2 teaspoon almond extract in a small sauce pot over medium-low heat. Let simmer while pancakes cook, stirring often. Top pancakes with the persimmon puree and toasted sliced almonds if desired. Ha! I had the same experience with a persimmon last year. So gross! I couldn’t get that taste out of my mouth for 5 hours or so. But that’s just the Hachiya type of persimmon – the Fuyu type is short and squat, and can be eaten hard like an apple. Soooo delicious. Ca’t wait to try them in pancakes! Ah, good to know! Might have to look out for the Fuyu type next time. I’ve seen them before but didn’t realize you could eat them differently. I have only eaten Asian persimmons – and they must’ve Fuyu type, because when they’re are bletted properly, the flesh is sweet and the skin is fine too! I make buckwheat persimmon pancakes with chopped pieces, but I’ll have to try this version with the pulp mixed in! Great recipe! I have never tried a persimmon but if you are comparing them to dessert I will need to try them! I tried persimmon for the first time a couple of years ago, but made the mistake of eating the skin. Not pleasant! I’ll have to give them another try (sans skin). Your recipe sounds great! Love the addition of the almonds. I bet that gives the pancakes a little more staying power. 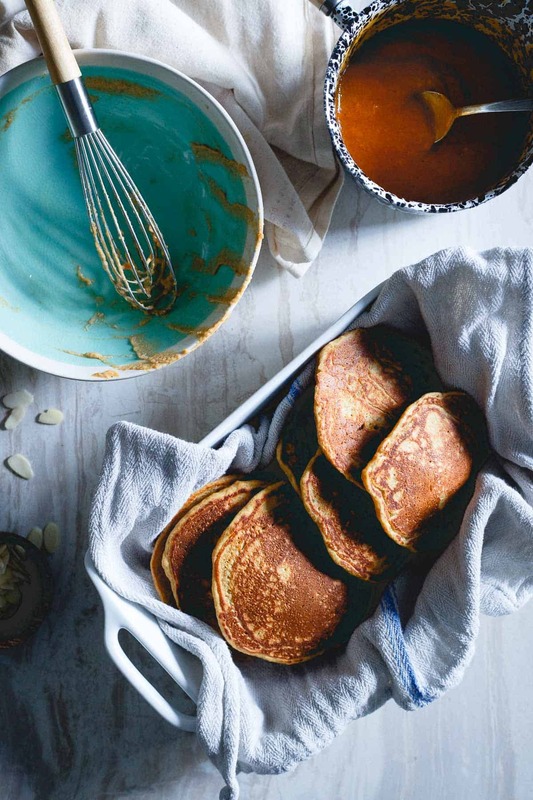 This is hands down the most tempting pancake recipe of your series (in which all your pancake recipes sound wonderful!). I eagerly await persimmon season every year and then never eat as many of them as I should. I must try these! I want to try persimmons! I’ve never had them! thx for the tip about the skin!!! It doesn’t matter how full I am, your blog always makes me hungry. Those look INCREDIBLE! Ah-mazing. I will have to keep this in mind if I have a few leftover persimmons! I have a whoooole bunch (both kinds) from the farmer’s market the other day, and I have great plans for them! Did you use the Hachiya kind? They’re the kind that go totally gooey. If you try the Fuyu kind, you can eat them like apples while they’re sorta firm, but yeah, peel the skins! These look sooo good! And they better have made it onto the food sites b/c the pics are awesome! Hm. I am making them now and maybe I’m doing something wrong, but there was not nearly enough liquid. I added milk (probably doubled it) and they wouldn’t stick together or cook through. Then I added an egg, and still they are not holding together. Perhaps I did something wrong. Wow ! I would have done the same thing with the fruit. I did not know you scoop it out. My inlaw grows hundreds of thouse and then throws them out, cause no one eats them. The color looks very unattractive to me, so I have never eaten the fruit. Here in the Philippines, we called that “HOT CAKES”. Pan cake or hot cake is easy prepare, as long as we know the procedure on how to do it. This cake is really great for the afternoon snacks or perfect to prepare for the visitors. I am making these now and had to add milk-persimmon+egg alone was not enough to make it into even a spreadable batter- maybe my persimmons aren’t juicy enough? oh wow, I definitely left out the milk in that recipe by accident! You’re spot on, there should definitely be some in there. Sorry about that! Hello! I had a craving for persimmon (my grandma used to make the pudding) and thought pancakes would be a great idea. I searched this out and found this recipe. Looking forward to making them! Thanks for havin this recipe. I am curious as to what the white sauce is you have in the pictures. It looks like a great replacement for syrup, which I think would be too much for the persimmon. Would you mind sharing the recipe for the sauce with me? I made these for breakfast today with a persimmon cranberry sauce and they were out of control! great idea with the almonds! I’m a huge persimmon fan as I grew up eating these fall delights. The recipe sounds amazing, I’ll try a batch after posting this. I wanted to give a little helpful advice that seems to throw most people with this fruit. The fuyu persimmon is eaten firm with no soft spots, like an Apple. The darker the Orange color the better and more sugary it will taste. The hachiya persimmon is a bit different, you still want a dark Orange color but in order to be able to eat this one (skin and all) with no bad taste it needs to be soft. I’m talking over ripe soft for most other fruit. It needs to feel like you can turn this thing to mush with one squeeze, I know this doesn’t sound appetizing to most, which is why people end up getting to eat under ripe persimmon from time to time. If hachiya persimmon is eaten even a little under ripe you’ll get anything from chalky taste to taking the moisture out of your mouth :-) . Most don’t enjoy eating such a soft fruit and opt for the firm fuyu, but for recipes, get a properly ripe hachiya and you don’t need to peel the skin, just pure and enjoy! Hope this helps. There are several varieties of persimmon. There are baking persimmons and persimmons that taste perfectly fine to eat. You bit into what was probably a “Hachiya” persimmon (it is very red-orange and heart shaped). Those are just nasty. The jiro persimmon (pale orange and shaped like a tomato) is not chalky nor bitter and has a mild (slightly pumpkin-ish but better) flavor. I’m horrible at making pancakes. . yours look amazing!!! and I LOVE the persimmon puree!!!! I agree! I love persimmons! Dessert for breakfast always wins in my book Gina! And these pancakes sound just delicious! The pretty color of that persimmon puree! OMG! Oh I LOVE persimmon! I can never figure out how to bake with it. These pancakes sound divine! Our local fruit stand is brimming with ripe persimmons right now! I just bought some, and I’m so excited to make this! I love all the winter citrus, but it’s nice to have a super sweet fruit this time of year. Thanks for the great idea! Such a good idea! I can’t wait to try it, especially since I’m a huge fan of persimmons! I LOVE PERSIMMON’s and love to bake with them! These sound delicious. I cannot wait to try! That persimmon topping is THE prettiest!! 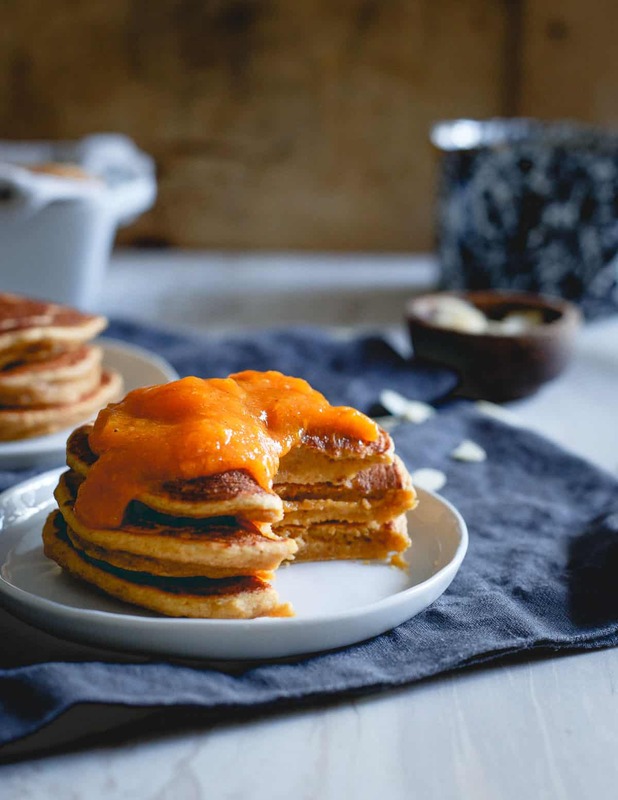 I absolutely LOVE that you made pancakes with persimmons! I can’t believe I haven’t tried that before, and I eat persimmons all the time! Beautiful, Gina. (P.S. This is embarrassing, but this is my first time going on your blog after the design change! It looks great! Can’t get the right consistency. Good flavor but they are falling apart.